ARLINGTON, V.A. – A new solar-powered underwater robot technology developed for undersea observation and water monitoring will be showcased at a Sept. 16 workshop on leading-edge robotics to be held at the National Science Foundation (NSF) in Arlington, Va.
Arthur C. Sanderson, professor of electrical, computer, and systems engineering at Rensselaer Polytechnic Institute, will display the robotic technology being developed by a team of research groups, including Rensselaer, and led by the Autonomous Undersea Systems Institute directed by D. Richard Blidberg. As the principal investigator of an NSF-funded project called RiverNet, Sanderson is working collaboratively with other researchers to develop a network of distributed sensing devices and water-monitoring robots, including the first solar-powered autonomous underwater vehicles (SAUVs). 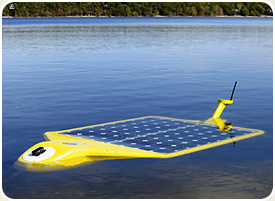 The SAUV technology allows underwater robots to be deployed long-term by using solar power to replenish onboard energy. According to Sanderson, the SAUVs communicate and network with one another in real time to assess a water body as a whole in measuring how it changes over space and time. Key technologies used in SAUVs include integrated sensor microsystems, pervasive computing, wireless communications, and sensor mobility with robotics. The SAUV weighs 370 pounds, travels at speeds of up to 2 miles per hour, and is designed to dive to depths of 500 meters.